This complete Uganda holiday reveals the beauty, diversity and little visited gems of this small African country. It’s a 16 day tailor made and privately guided tour which takes in six national parks and includes safaris on boats, by bike, on foot and in a private 4x4. You will also go trekking in search of mountain gorillas once and chimpanzees twice and there is also the chance to try some adventure sports in Jinja. This is a holiday that offers a really comprehensive exploration of this wonderful country, full of surprises and memorable experiences. 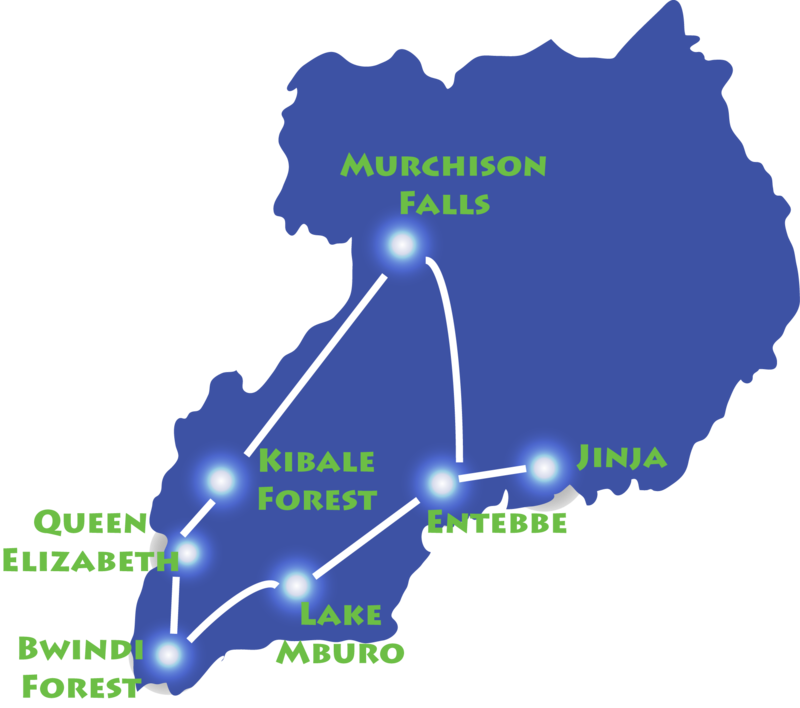 The holiday starts in Entebbe and you then travel north to Murchison Falls National Park where you will spend three nights. See the Falls from the top and bottom, take private boat safaris spotting hippo, crocodiles and even elephants on the river bank, and explore the savannah, looking out for hyena, lion and leopard. Next, visit Kibale Forest, to hike through the dense greenery in search of wild chimpanzees before moving on to Queen Elizabeth National Park, where you can look out for savannah wildlife from your 4x4 and safari boat. In Kyambura Gorge you can take your second trek to see chimpanzees in the wild. No trip to Uganda is complete without a glimpse of the mountain gorillas that live here, and in the Bwindi Impenetrable Forest you will take a trek to spot these rare, beautiful creatures, before spending two days in beautiful Lake Mburo National Park, where you can take a bike tour and enjoy a walking safari to see zebra, impala, topi and eland. Your holiday is rounded off with two nights in Jinja. This is the perfect place to chill out and watch the Nile flow lazily from its source, but it’s also an adventure sports hub, with white-water rafting, bungee jumping, quad biking, fishing and horse-riding safaris all on offer here. Your final night is back in Entebbe, where a sunset cruise on the lake is a lovely end to this complete Uganda holiday. Murchison Falls was wonderful but seeing the gorillas was something we had wanted to do for many years so was probably the highlight of the trip. The locals are very friendly and our holiday was enhanced by going out and walking through several of the local villages and interacting with the villagers. The money one is injecting into the local economy clearly boosts employment and the combination of solar power and careful water husbandrry means that the environmental impact of the lodges is quite low. The park entrance fees and, more particularly, the gorilla and chimpanzee permit fees make a significant contribution to the effort that is put into conservation of these animals. However, I felt that the visits in particular to the chimpanzees were too intrusive and the groups of chimps in Budongo are subjected to several hours of tourists per day and the guides ignore the guideline of maintaining a distance of at least 8 metres. the country, and indeed throughout Africa, is a worrying and ominous sign that things are going to get much worse in the next few years. landscape was stunning. The joy of trekking to see mountain gorillas will stay for a lifetime. Certainly helped the locals. However, water was always in plastic bottles as local water not the best. So I hope they recycle them. A fantastic, tailor-made trip. Well paced, varied. Excellent accommodation. Brilliant, friendly staff. Excellent food throughout. Tough, but rewarding trekking. with great staff and excellent food and standards. Wonderful, smiling, happy people...respectful and friendly. Seeing the Gorillas in the impenetrable forest. Go to the gym, as the Gorilla and Chimpanzee tracking is very physical. Yes - at least one the places we stayed at provided/supported a local playground for the local children. Fantastic definitely would recommend this operator, we met lots of other UK tourists whilst we were in Uganda and would say that our holiday organisation and information seemed better than the various other companies, the other tourist were travelling with. We were initially a little nervous as the company were based in Uganda and not being a UK company, with regard to transferring money.